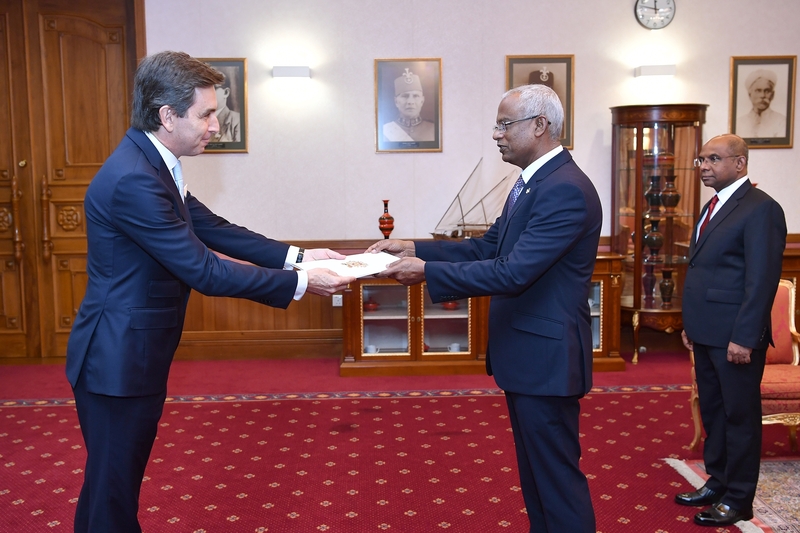 The newly appointed Ambassador of Portugal to the Maldives, His Excellency Jose’ De Pinho Pereira formally presented his credentials today at a ceremony held this afternoon at the President’s Office. President Solih warmly welcomed the Ambassador to the Maldives and expressed his hope that the beginning of his ambassadorial tenure will herald the reinvigoration of positive ties between our two countries. Both the President and Ambassador acknowledged the historical encounter between the Maldives and Portugal many centuries ago, whilst emphasizing that the future is what holds more importance. Both the President and Ambassador expressed their mutual hope that Portugal and the Maldives can begin a new chapter in positive cooperation on a number of avenues, including in sport, economic development, and renewable energy. The Ambassador stated that it was a privilege to represent his country to the Maldives and expressed the positive hope that bonds between Maldives and Portugal will further strengthen during his tenure.